Oral turinabol sufficiently resembles methandrostenolone not only on the structure of the molecule but the action of both drugs is also very similar. 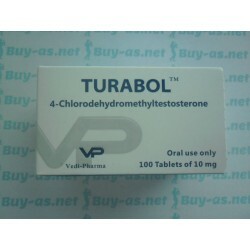 Turinabol produces less gains, but this is “quality”, lean mass and also it produces less side effects. Despite turinabol does not aromatize and is quite mild drug, prolonged usage may cause the suppression of secretion of endogenous testosterone but at much lesser extent comparing to methandrostenolone (dianabol) and it’s easily rejuvenated. Turinabol is mostly used to build lean body mass and strength without water retention, which often occurs with Daianabol and testosterone. The results with Turanabol straightly depends on the daily dosage, which normally varies between 20 to 100 mg. Athletes below 90 kgs experience no side effects at 20 mg daily and more heavy athletes easily adopt 40 – 50 mg daily.